The city of Iasi, in north-eastern Romania, was mentioned in documents for the first time by Alexandru cel Bun (Alexander the Good). 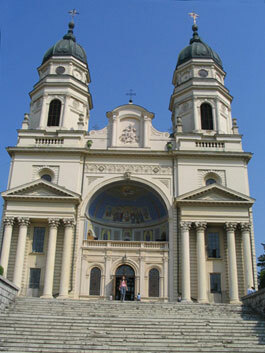 The Metropolitan Cathedral – Iasi. Iasi is a remarkable educational centre and preserving some beautiful pieces of architecture, like Trei Ierarhi Church and the neo-Gothic Palatul Culturii (Palace of Culture) (the place where are to be found four museums: the History Museum, the Technology Museum, the Ethnography Museum and the Art Museum). Many buildings in the old city center were demolished during the Communist regime, with a few Soviet-style blocks of flats, but also some recent modern buildings, like “Petre Andrei” University or “Europa” Hotel built instead. Alexandru Ioan Cuza University – Iasi. 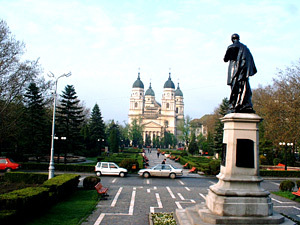 It is said that the University of Iasi is the oldest university in the country. It was officially opened on 7 November 1860 by Domnitor Alexandru Ioan Cuza, nowadays named after him. In fact, we can say that it was built upon the “Academia Mihaileana”, founded by Mihail Sturza in 1834. And if we are to make an incursion in time, we can say that it is a symbolic continuation of the old Royal Academy of Iasi, founded in 1642 by Vasile Lupu. The present building, combining the Baroque and Classic styles, was built between 1893 and 1897 after the punctilious plans of architect Louis Blanc. It was opened by King Carol I and Queen Elisabeth. The entrance is through Sala Pasilor Pierduti (the Hall of the Lost Steps), famous for the paintings made by Sabin Balasa. Sala Pasilor Pierduti (Hall of the Lost Footsteps). If in the beginning it had only three faculties, nowadays “Al. I. Cuza” University of Iasi can be proud of having 15 faculties and a series of colleges: the Faculty of Biology, the Faculty of Chemistry, the Faculty of Law, the Faculty of Economics and Business Administration, the Faculty of Physical Education and Sports, the Faculty of Philosophy, the Faculty of Physics, the Faculty of Geography and Geology, the Faculty of Computer Science, the Faculty of History, the Faculty of Letters, the Faculty of Mathematics, the Faculty of Psychology and Education Sciences, the Faculty of Orthodox Theology and the Faculty of Roman-Catholic Theology. Prestigious scholars, like Grigore Cobalcescu, Petru Poni, Alexandru Philippide, Alexandru D. Xenopol, Dragomir Hurmuzescu, Alexandru Miller, Octav Mayer, Gheorghe Bratianu, Grigore T. Popa, Gheorghe Platon, Alexandru Zub and others studied at the University of Iasi. Upstairs the University there lays the Parcul Copou (Copou Park), a public garden whose main attraction point is Teiul lui Eminescu (Eminescu’s lime-tree), a place where the poet is said to have come very often to write his poems. 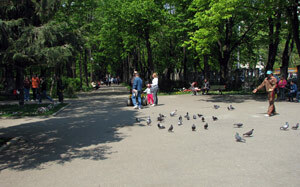 The park was founded during Mihail Sturza’s reign, in 1835. Initially the place was chosen on Podul Verde (Green Bridge) alleyway, instead of the old post-office station of the town. Then, between 1849 and 1852, the park was expanded, and in 1860 it was lighted up with street lamps. 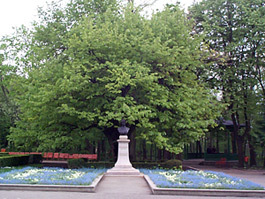 Teiul lui Eminescu (Eminescu’s lime-tree) from Copou Park – Iasi. 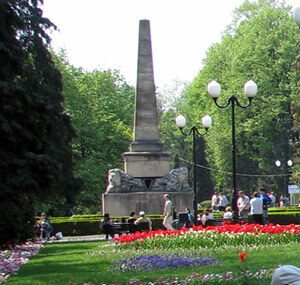 About Teiul lui Eminescu (Eminescu’s lime-tree) it is said that it is a successor of the Copou forest, and that it was so beautiful at the time when the public garden was arranged that it was kept, although it hadn’t been included in the central axis of the park. 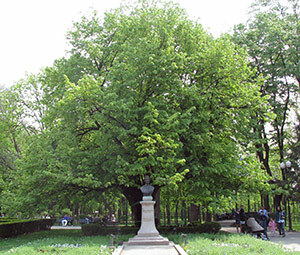 For years, Teiul lui Eminescu (Eminescu’s lime-tree) has been a symbol of Iasi and a pilgrimage place for lovers as well. In front of the Linden tree there is the bust of the poet. In the ‘80s the Linden tree almost died because of a concrete stopping placed inside its thunder-stroke and storm-broken trunk. Happily, almost by a miracle, roots have gone down from its branches near the stopping, thrusting into the ground. As professor Mandache Leucov said, these kind of adventive roots are extremely rare. Obeliscul Leilor (Obelisk of the Lions) from Copou Park – Iasi. Near Eminescu’s lime-tree there is also Monumentul Legilor Constitutionale (Constitutional Laws Monument), known also as Obelisk of the Lions, build by Mihail Sigurov in 1834, after one of Gh. Asachi’s projects. The monument is formed of a 15 meters stone column that lies on the back of 4 lions, symbolizing the four European powers that had accepted the independence of the Romanian Lands. 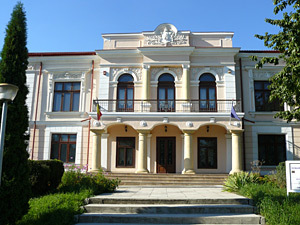 “Mihai Eminescu” Museum, opened in 1990, and Casa de Cultura a Municipiului “Mihai Ursache” (“Mihai Ursache” City House of Culture) are also located in Copou Park. One cannot talk about Eminescu without mentioning his best friend, Ion Creanga. His memorial house, known especially as Bojdeuca lui Ion Creanga, is located in Ticau quarter, on Simion Barnutiu Street, on the left as you come down on Sararie Street. The name of the picturesque quarter is highly connected to the name of the writer born in Humulesti. Ion Creanga lived in this house between 1872 and 1889, when he passed away. Inside the two rooms of the house the visitors can admire especially the furniture, composed of small chairs and a round table, a peasant bed, dishes and bowls, pots and cast-iron kettles near the stove where the forc-meat rolls in cabbage and the pies were cooked. Bojdeuca lui Ion Creanga became a museum on 15th of April 1918 and it was the first memorial house in Romania. 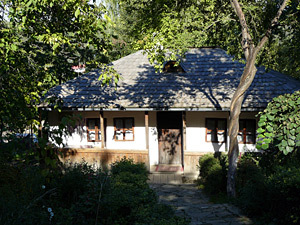 Eminescu also lived for a while in the tiny hut from Ticau, in 1876, when he was in Iasi. 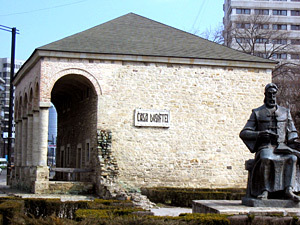 In the tiny hut’s yard there is the writer’s sculpture, made in 1990 by some students from the Fine Arts Academy, and also Creanga’s bust made of granite by sculpture Iftimie Barleanu in 1968. 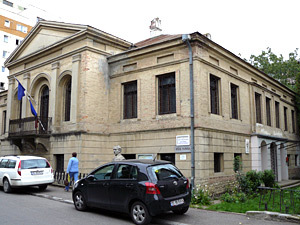 Vasile Pogor memorial house, also called the house with the lighted windows, because it was among the first houses in Iasi which had electric light, is located downstairs the “Al. 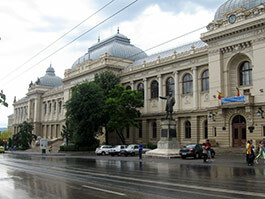 I. Cuza” University, and houses the Romanian Literature Museum. The building was built in 1850 by nobleman Vasile Pogor, the one who was three times elected as mayor of Iasi. The meetings of “Junimea” Literary Society, the one that founded the “Convorbiti Literare” Review, took place here. On 26th of December 1972, the Pogor House became a Museum, having in its patrimony hundreds of pieces from the great classics era, Romanian and contemporary literature. Among the most representative exhibits we can enumerate Eminescu’s golden watch, with monogram, his ruby golden ring, one of Mihail Kogalniceanu’s pieces of furniture, Costache Negri’s voyage set and his correspondence, G. Asachi’s painting called “Cap de dac” and Duiliu Zamfirescu’s piano. “Gramatica” (“The Grammar”) by I. Vacarescu, “Critice” (“Critiques”) by T. Maiorescu and “Almanah de invatatura si petrecere” (“Almanac of Learning and Feast”) by M. Kogalniceanu are among the most valuable exhibits of the museum as well. Built on the place of the old mayoralty, after the plans of architects Fellner and Helmer between 1894 and 1896, the building of the National Theater of Iasi shelters some real art jewelries. First of all, there is the Curtain painted by M. Lenz in 1896, which presents in the middle an allegory of life, with the three ages, and the allegory of Romanian Unification on the right side. There is also the Iron Curtain which completely separates the scene from the hall, and which was painted with symmetrical ornaments by Al. Goltz. The ceiling was also painted by Al. Goltz, presenting paradise allegories with nymphs and angels in Rococo style. And, of course, there is also a Venetia crystal chandelier with 109 bulbs, which was from the very beginning connected to the electric plant located nearby and opened at the same time as the theater. 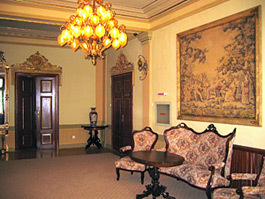 Nowadays the “Vasile Alecsandri” Theater hosts also the National Romanian Opera. The Theatre Museum of Iasi, founded in 1976, is the only one in the country and it is located in a building that was built in 1870, few hundred meters far from Piata Unirii (the Union Square) and that belonged to poet Vasile Alecsandri. Inside the museum one can admire the exhibition of posters, books, manuscripts, costumes, pieces of furniture and medal collections, exhibits that present the evolution of theatre in Romania from its first manifestations. 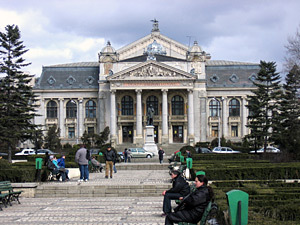 The University’s Central Library «Mihai Eminescu» – Iasi. 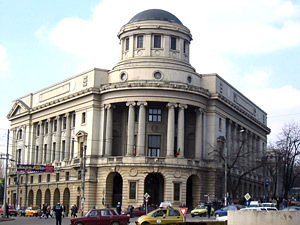 The present building of the University’s Central Library “Mihai Eminescu” was built between 1930 and 1934, as the headquarters of the Ferdinand Collegiate Foundation and for housing an extensive library and a Science Institute. After the plans of architect Constantin Jotsu, the exterior is marked by columns in ionic style, while the interior is worked with Carrara marble and Venetian mosaic. In 1945 the building was transferred to the University’s Central Library. Nowadays it shelters over 2.5 million books and publications. Among the most valuable works we can enumerate “Evanghelia cu invatatura de Coresi” (“Gospel with knowledge by Coresi”), printed in 1581 (the oldest Romanian book from Iasi) and also “Cazania lui Varlaam” (“Varlaam’s Homily”), published in 1643 during Domnitor Vasile Lupu’s reign, at the first printing house in Moldavia, that from The Trei Ierarhi Church. Dosoftei House), located in the vicinity of Palatul Culturii (Palace of Culture), was built between 1677 and 1679, during Domnitor Antonie Voda Ruset’s reign, and housed the second printing device in Moldavia, taken care of by Metropolitan scholar Dosoftei with the help of Nicolae Milescu-Spatarul. Inside the museum one can find unique samples of old books, worship objects and a very valuable copy of the “Letopisetul Tarii Moldovei” (“The Chronicles of the land of Moldavia”) by Grigore Ureche. 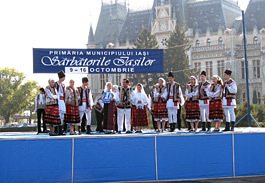 Cucuteni 5000, Traditional Ceramics Fair – Iasi. 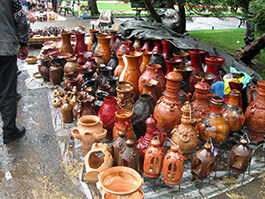 Every year, in June, the “Cucuteni” 5000 Traditional Ceramics Fair takes place in Iasi. This event takes place in Copou Park, where you can see almost 100 potters, from the most important pottery centers in the country: Catamaresti Hill and Dorohoi-Botosani, Branistea-Galati, Corund and Miercurea Ciuc-Harghita, Stavnic Hermitage-Iasi; Baia Mare-Maramures; Vadastra-Olt; Marginea and Radauti-Suceava; Horezu, Lungesti and Vladesti –Valcea and also from Dochia, Ialoveni, Nisporeni and Chisinau-The Republic of Moldavia. 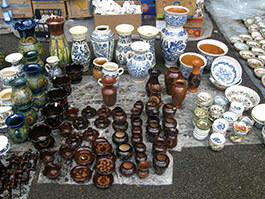 The items presented in this fair can be bought, their prices ranging from 2 lei to 50 lei. The ceramic vessels are enameled with various colors (cups, vessels for forcemeat roll of cabbage (wine) leaves and other items made of clay, realized in a rustic and authentic manner). The organizers of this event are the District Council from Iasi, Iasi Townhall, The Direction for Culture, Cults and the National Cultural Patrimony and The District Center for the Conservation and Promotion of Culture. 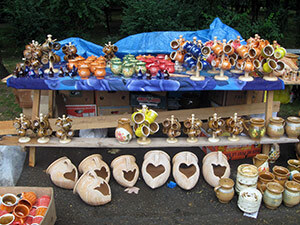 The organizers offer diplomas and money to the potters that take part at the fair, potters that have promoted lately this old occupation of the Romanian folk. 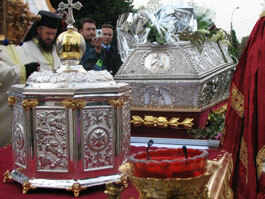 Between 9-16 October a great festival is organized by local municipality: Iasi Feast (Sarbatorile Iasului) bringing together over a million persons every year, from our country and from abroad, come to worship Saint Parascheva’s Relics. 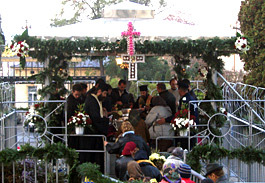 During the festival the relics of Saint Parascheva are taken in the outside. Al. 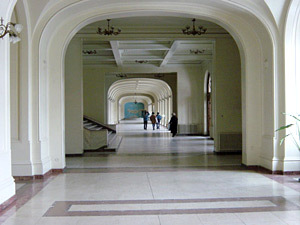 I. Cuza University – Iasi. Inside of Vasile Pogor memorial house. 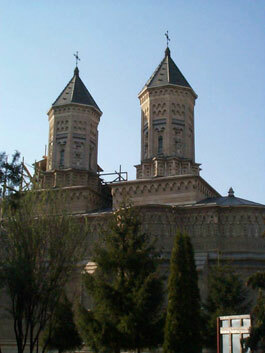 Trei Ierarhi Church – Iasi. 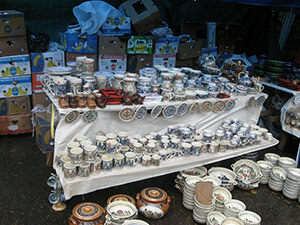 Cucuteni 5000 – Traditional Ceramics Fair – Iasi. 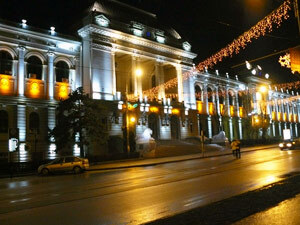 IASCH(IASI)-IS AMAZING AND COOL CITY! Best city, best people, best food! Schade dass viele deutsche das nicht wissen. In noarth-east Romania are very beautiful mountains to make ski: Vatra-Dornei, Neamt, Durau, Suceava-wih CHRISTMAS is amazing, Carpathians-Mountains: Kronstadt(Brasov) or Siebenbürgen, and BLACK-SEA-THE BEST OF EUROPE ARE IN ROMANIA: warm weather: 30-38 grad NOT RAINING; BEST NIGHT-LIFE AND ATMOSPHERE, BEAUTIFULL GRADUATE PEOPLES; AND BEST FOOD IN EUROPE ARE IN NORTH-EAST Romania: because hot with pepper and cayenne, and tomato-sauce like in ITALY with many ingredients and not sweet as in hugarn part of Romania! I was in Iasch (IASI) North-East Romania!IT´´s was amazing! Very good culinare art and food, very friendly and beautyfull peoples, very many cultures-objects and museens, theatres, incredibles discos and amazing night-life atmosphere, very good wines and interesting tradition. I was to make ski in “Vatra-Dornei” and “Gura-Humorului”, so mountains I don´t see bevore it. I was last summer in MAMAIA and Neptun on the BLACK SEA:COOL,COOL; AMAZING!!! IT´S WAS BEST EXPERIENCE OF MY LIFE! I go one more time,next summer with my husband and many friends to ski in NordEast: Neamt and Suceava, and to Black Sea! PARADIS AUF ERDE!!! Like Subash said in an earlier post, there’s magic in this City! last time I went there, it took about 8 hours. but now I take an airplane. 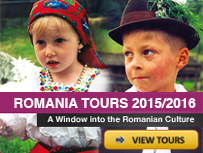 they have them right from OTP to Iasi. howw long takes iasi-bucarest by train? i live in romania and ..yea it’s a great place.The people are too good in moldova (a part of a country)..so..if u don’t visit romania..u have to visit because hehe are so many cool places!!!! 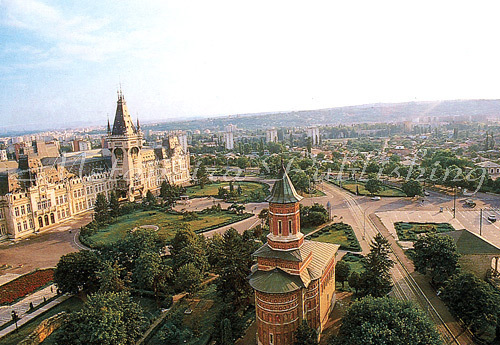 I visited Iasi in July 2009 and found a beautiful city and friendly people. I will be back in 2010 for a longer stay. 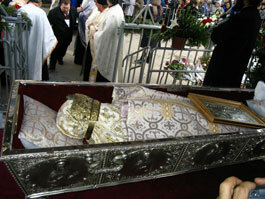 i lived years in iasi, andit s a part of my life. 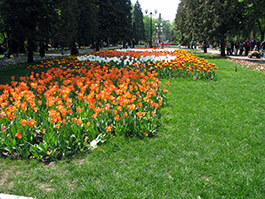 Hi, am from India and visited Iasi in June/July 2009 to meet an old friend. Am so much in love with Iasi, think there is some magic in this land. Its just beautiful. I live in london for the last 9 yrs but i miss Iasi so much! it’s a lovely place to be! i love it!!! I’m an American and I live in Iasi! It’s a great city! Come and visit!!! My dear friend who lives in this city shares this site with me. As an American, I am woefully ignorant of the beauty and majesty of Romania. Through my friend and through this site, I learn. I am in awe of this splendid city and its history. I hope to visit someday. I lived in this beautiful city for 6 years, very good people, good teachers and professors.